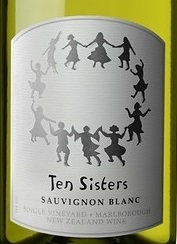 Ten Sisters Sauvignon Blanc has a delightfully fragrant and complex bouquet with underlying citrus aromas. The palate is crisp and lively, its elegant layers hinting of tropical fruit. The finish is long and well-balanced.